The NBIA Disorders Association is a 501(c)(3) nonprofit organization that relies on the generosity of people like you to provide much needed services to the NBIA disorders community. All donations are tax-deductible to the fullest extent allowed by law. You may make your gift in honor of or in memory of an individual or family and that information is published in our newsletter. Your gifts help to support families affected by Neurodegeneration with Brain Iron Accumulation, educate the public about this disease, and advance, monitor and support research through our research grants program. 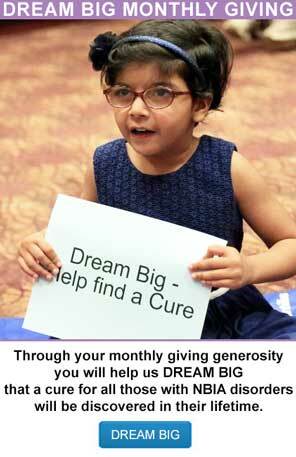 A key part of our mission is to find a cure for NBIA. More than 90 percent of our contributions go directly to programs and services for patients and families. You can make a secure donation today through the NBIA Disorders Association’s website via PayPal or by mail. For more information on giving to the NBIA Disorders Association, please contact Patty Wood at pwood@NBIAdisorders.org.